Up in the archives, we have been busy indexing a collection of over 300 different religious pamphlets from the 18th and 19th centuries. Most of these soft-cover, professionally printed booklets contain a single sermon given in a Hingham or South Shore church, although there are also religious tracts, catechisms, devotional literature, and Sunday School texts. There is even a pamphlet of marital advice to husbands and wives. Our religious pamphlet collection provides a useful complement to the Hingham church records preserved both in our archives and at other institutions. They tell an important story of the development of Protestant Christianity in this small corner of the country from the Great Awakening to the rise of liberal Christianity and Unitarianism to the evangelical reaction of the Second Great Awakening. As the 19th century progressed, social issues such as abolition, temperance, and social inequality increasingly became the subject of sermons in Hingham and South Shore pulpits. 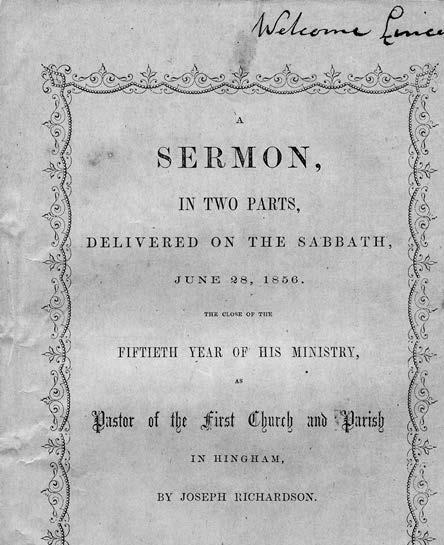 Preaching—whether written or delivered from the pulpit—was popular in 19th century Hingham, as the many multiple copies in our collection of certain “favorites” by local preachers Joseph Richardson (Pastor of First Parish or “Old Ship” Church from 1805to 1868) and Oliver Stearns (Pastor of Third Parish or “New North” Church from 1839 to 1856) attest. Many of our copies of the sermons of Ebenezer Gay (Pastor of First Parish from 1718 to 1787) are reprints, demonstrating that he retained an audience for his sermons 50 years after his death. 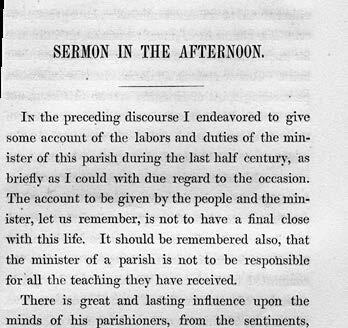 Even in the mid-19th century, attending Sunday church services in Hingham was an all-day affair, and preaching was a central part of the services in our Protestant churches. 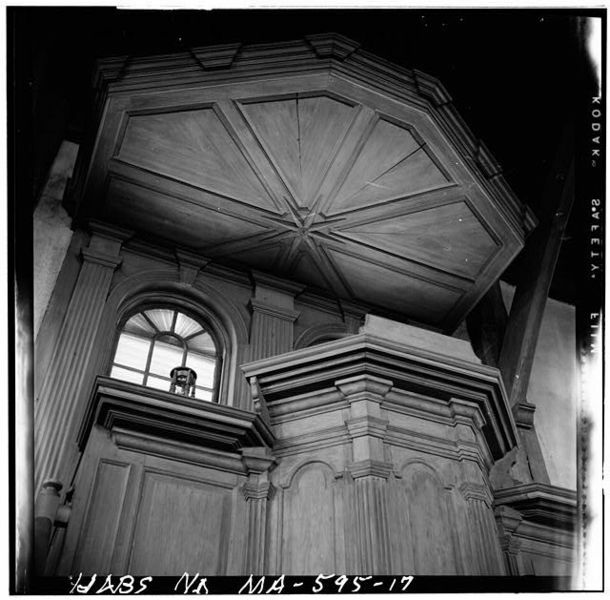 (The pulpit of Old Ship Church in the photo at the top of this post attests to this.) These sermons are long by contemporary standards, most of them 25-30 pages long. 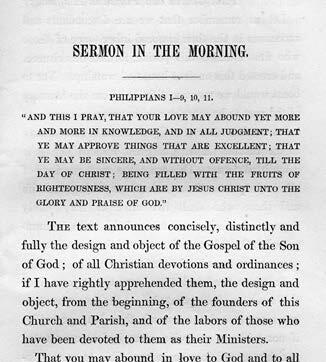 A number of the sermons are in two parts: one for the morning service and one for the afternoon. They are dense and closely-argued, raising the unhappy suspicion that our ancestors’ attention spans, or at least their listening skills, were better developed than our own. Sunday, June 28, 1858. The morning’s sermon . . . This entry was posted in Uncategorized and tagged Archives, churches, Ebenezer Gay, First Parish, Joseph Richardson, religion, Third Parish.